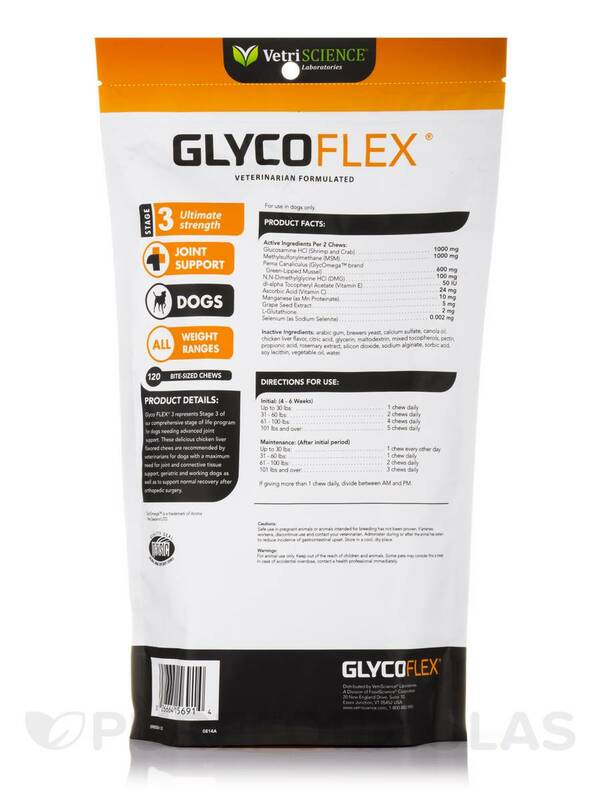 My veterinarian suggested Glyco-Flex III by Vetri-Science Laboratories for my older dogs and they couldn't manage without it. A great price as well. My veterinarian suggested Glyco-Flex III by Vetri-Science Laboratories for my older dogs and they couldn't manage with out it. A great price as well. I routinely buy the Glyco-Flex III by Vetri-Science Laboratories for my elder dogs, it really works! They enjoy the chews so it makes it easier to give to them. Perna‚ Glucosamine‚ MSM‚ DMG‚ and Antioxidants for Advanced Joint Support! VetriScience® Laboratories’ Glyco FLEX® 3 Bite-Sized Chews represent the third stage in our comprehensive life stages joint support program for dogs‚ and is recommended for dogs in need of maximum joint support. It is also recommended by veterinarians for geriatric and working dogs and as a follow-up to support normal recovery after orthopedic surgery. This formula contains higher levels of glucosamine‚ MSM‚ manganese‚ and DMG‚ and includes grape seed extract and L-glutathione for added support. Glyco FLEX® 3 is designed to support joint comfort‚ flexibility‚ and mobility. Inactive Ingredients: Arabic gum‚ brewers yeast‚ calcium sulfate‚ canola oil‚ chicken liver flavor‚ citric acid‚ glycerin‚ maltodextrin‚ mixed tocopherols‚ pectin‚ propionic acid‚ rosemary extract‚ silicon dioxide‚ sodium alginate‚ sorbic acid‚ soy lecithin‚ vegetable oil‚ water. Up to 30 lbs: 1 Chew daily. 31 - 60 lbs: 2 Chews daily. 61 - 100 lbs: 4 Chews daily. 101 lbs and Over: 5 Chews daily. Up to 30 lbs: 1 Chew every other day. 31 - 60 lbs: 1 Chew daily. 61 - 100 lbs: 2 Chews daily. 101 lbs and Over: 3 Chews daily. If giving more than 1 chew daily‚ Divide between AM and PM. For use in dogs only. Safe use in pregnant animals or animals intended for breeding has not been proven. If lameness worsens‚ discontinue use and contact your veterinarian. Administer during or after the animal has eaten to reduce incidence of gastrointestinal upset. Store in a cool‚ dry place. For animal use only. Keep out of the reach of children and animals. Some pets may consider this a treat. In case of accidental overdose‚ contact a health professional immediately. Our vet recommended we give our Borde Collie Glyco-Flex III (Dogs) by Vetri-Science Laboratories after knee surgery to help prevent arthritis etc. She has been taking it for 6 years. We used to buy it through on an online Pet Pharmacy until we discovered that PureFormulas carries the product and we save $3.00 dollars on every bag. It's easy to give her because it's a flavored chew. 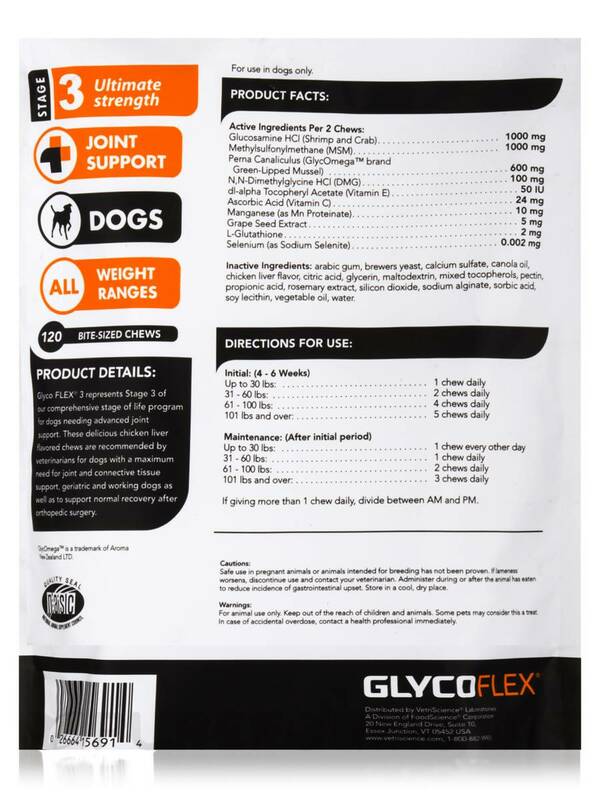 Originally purchased Glyco-Flex III (Dogs) by Vetri-Science Laboratories with my vet, however found it for almost $20 less here and free shipping (5-7 days). It was delivered 2 days after shipped! Very happy. Will be ordering again soon. Helps dogs of all ages! 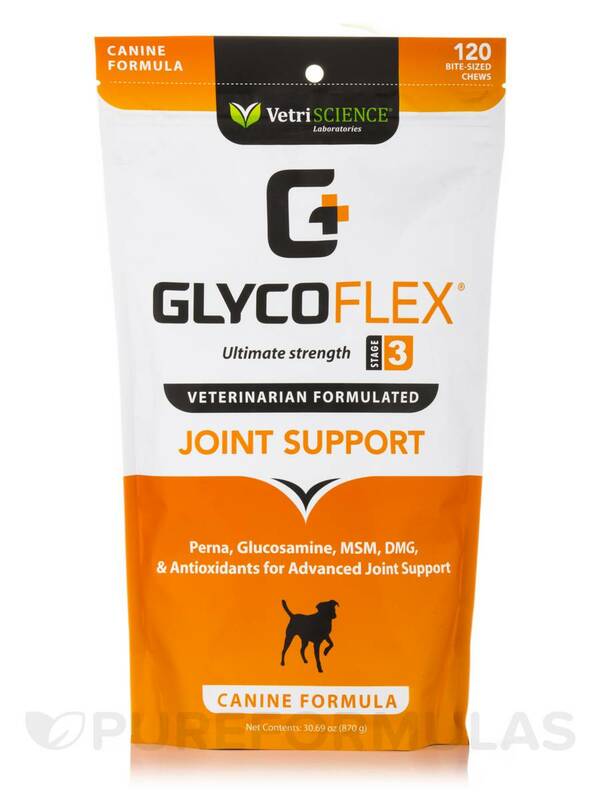 Glyco Flex III by Vetri Science Laboratories bone and joint health! Love the zip-lock packaging, they really think its treats! The look and feel of the packaging. To much like human supplements. Lets get creative and colorful! The doses are a treat for the dogs. No more pills spit out! A must for dogs with joint pain! I don't dislike this but it is a caution. When starting this product there is an initial dose higher than the daily dose. It just requires your attention.